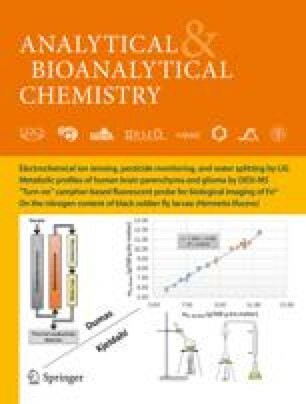 A new analytical method for the determination of bisphenol A (BPA) by LC/MS was developed and applied to environmental water samples. Quantitative MS detection of BPA was carried out in the negative mode. In order to preconcentrate the target compound yet prevent serious contamination of the water samples from the experimental environment, we employed column switching HPLC coupled with a pretreatment column of surface-modified molecularly-imprinted polymers. The recovery of BPA from a spiked environmental water sample was 102% and the repeatability of actual determinations of water samples containing 20 ng/L of BPA was 5.4% RSD. By modifying the surfaces of the molecularly-imprinted polymer particles packed in the pretreatment column, interference from the water samples was effectively removed, resulting in a significant increase in sensitivity and more reliable results. This method was successfully applied to the trace determination of BPA in environmental water samples using LC/MS. This research was partly supported by the Nanotechnology Project of the Ministry of Environment and a Grant-in-Aid for Basic Scientific Research (No. 14042232 & 16350082) from the Ministry of Education, Science, Sport, and Culture of Japan.